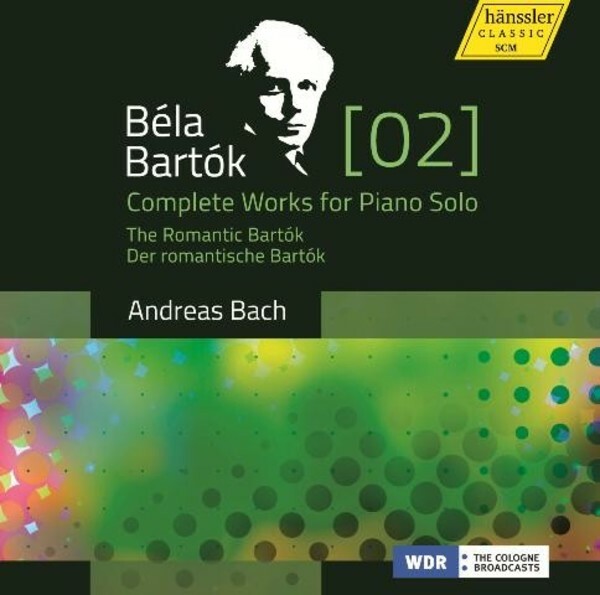 With this latest release (volume 2 of a projected 5 volumes) of his recording of the complete piano works of Béla Bartók, Andreas Bach focuses on Bartók’s romantic roots - those pieces that originated in his early period, and based primarily on the German Romantic tradition. These include the Funeral March from 'Kossuth', arranged by Bartók himself for piano, the Rhapsodie Sz.26, 2 Elegies and 4 Piano Pieces. Andreas Bach has quickly established himself as a masterful interpreter of Bartók‘s music, with enthusiastic reviews praising the edition‘s success: “... a project, that when complete, will be the most comprehensive presentation of Bartók‘s legacy as a keyboard composer ever available. (...) Of all the recordings and concert performances of these furious, earth-shattering, primitive works known to me, only my Philips recording with Zoltán Kocsis offers these fantastic keyboard scenes with comparable nuance, and sense of drama.” (Klassik Heute).